With the Avalon Health and Rehabilitation Center just a short jaunt from our own parking lot, Tri-Cities Retirement Inn senior services in Pasco, WA are top of the line. Whether you are a senior in search of a great atmosphere for senior living or are in need of assisted living or memory care for a loved one, our community has the highly-skilled staff, training and atmosphere perfect for the varied needs of today's seniors. We offer independent, assisted living and memory care and our fully-furnished private and semi-private suites with kitchenettes provide the ultimate choice in affordability and lifestyle needs. Independent Living: Our independent living senior apartments are the perfect solution for those ready to focus on socializing without the hassle of maintaining a house and the daily demands of cooking and cleaning. 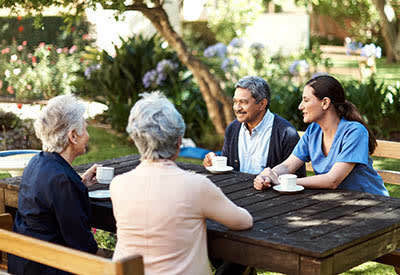 Assisted Living: Our caring staff is ready to provide assistance with daily activities like dressing, bathing, incontinence issues and medication management for those in our care with assisted living needs. Memory Care: Our trained staff members are experts in the needs of seniors with Alzheimer's and dementia-related care. In addition to their clinical training, every staff member goes through our own exclusive Meaningful Moments® training program to bring more meaning to the daily life of seniors battling Alzheimer's in our community.